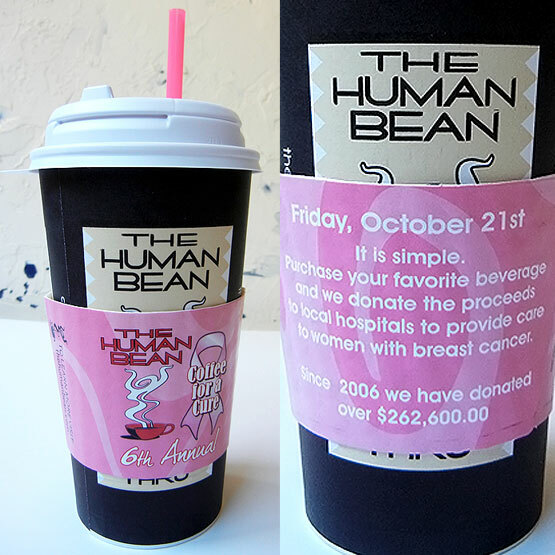 photos by me | The Human Bean donates all proceeds to the local hospitals on a certain day in October. This might be one of the most successful marketing ploys of the twentieth-century. Why? Because people don’t mind contributing when they feel like they are getting something out of showing their support. Take a look at the average consumer, who generally does not have or want to spend the extra cash to simply donate. Now they can donate and get something in return. 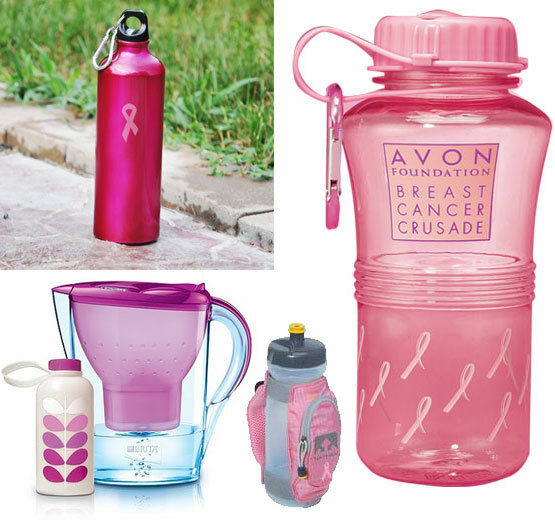 Wouldn’t you much rather spend $8.00 on a pink water bottle than donate $8.00 directly to a charity? I am going to buy a water bottle anyway. The sheer number of charities asking for donations can be daunting. How do you pick one if you don’t necessarily have a sentimental reason to go with one or the other? Being an average person and general consumer of every day products, I have no personal reasons to choose to financially support a cause. So unless someone asks me to donate I most likely wouldn’t think to donate if it wasn’t right in my face when I go to the store. But, since I’m there, I might as well buy the loaf of bread with the pink ribbon graphic promising to donate for me. I feel good about supporting a cause and I get my loaf of bread, everyone wins. Spare Change: Asking customers if they would like to round up their purchases to donate the extra change to a certain cause or charity. Normally something at a grocery store, but you could use this on a smaller scale in almost any type of situation. 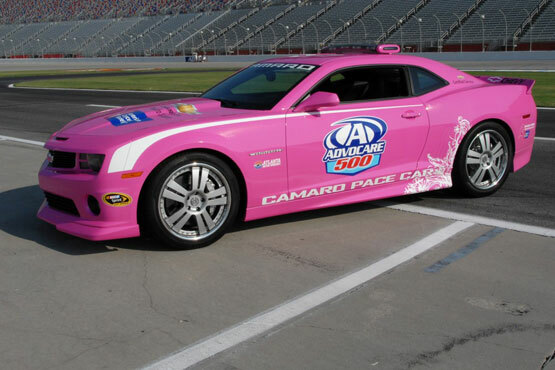 Color it Pink or add a Pink Ribbon: This is the biggest marketing scheme we see on a daily basis. Companies small and large use this method to generate awareness for their brand, products and the cause (of course). Pair up with a foundation or simply donate to local programs (organized charities, hospitals, groups) to draw in community members. With October just a hop over the fence, there is ample opportunity to get in on it some way or another! From using the color pink and boobies in unexpected product design or creatively funny ads, it's a great way to step out of your regular routine and make a splash at it! 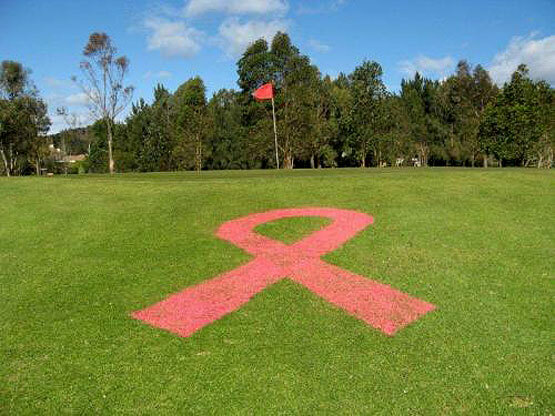 Jordan "Think Pink" | Nike "Think Pink"
Ladies Golf Breast Cancer Day at Jamberoo Golf Club. I'm actually surprised at how little Etsy crafters have made for Breast Cancer Awareness Month and I'm even more surprised that more than half the crafters displaying content for sale, are not even trying to pull off donating proceeds or a percentage to some foundation or another...which would probably help their purchases. Maybe we'll see more pop up as we get in to October more. 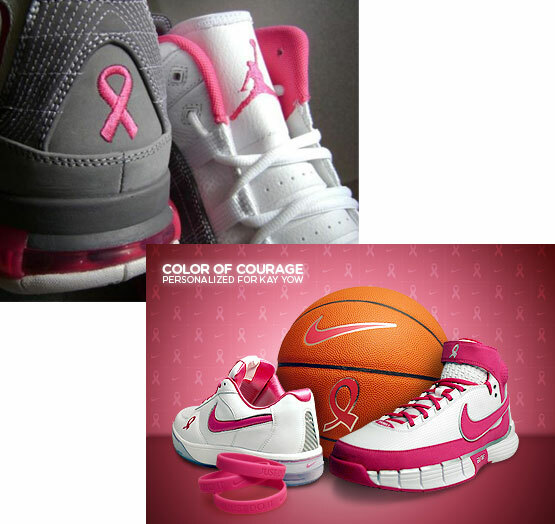 So is it wrong or right to run creative promotions and sell product based on Breast Cancer Awareness? 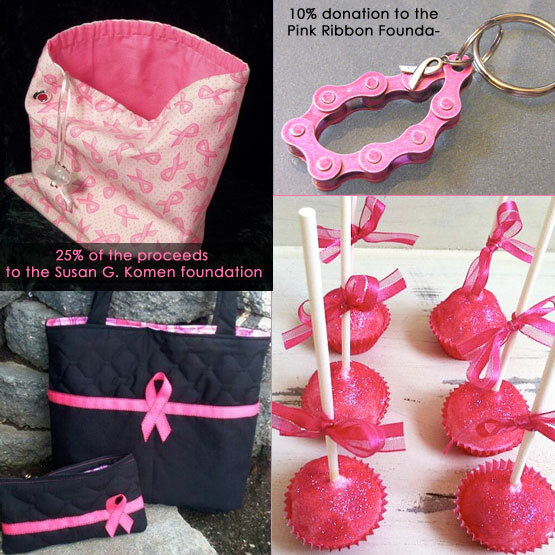 With October being the official month for Breast Cancer Awareness, there are plenty of opportunities to run a caused-based promotion with your small business be that an Etsy shop or physical business. So morally, is this a bad thing to run a creative promotion or sell your products based around Breast Cancer Awareness? When it comes down to the dollar and the sense of it all -- what this has really done is create HUGE avenues to more regularly and more actively generate money and massive awareness for these causes. Think of how much more funds have been raised due to proceeds and percentages donated by businesses than before when people were simply asked to provide a dollar donation. However funds are raised, the cause is important and breast cancer takes too many of our wonderful women. And as always directly donating to an organization is a great way to make a difference. Foundations such as the SUSAN G KOMEN - for the CURE provides tons of resources to understand Breast Cancer for both the diagnosed or if you just want to know more about it along with donating and finding things like races and events to be a part of. 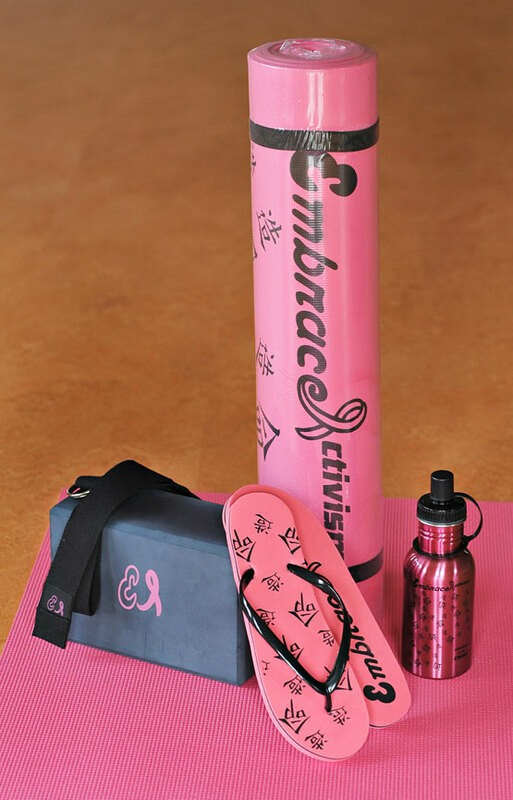 What's the coolest breast cancer product or ad you've seen? If you are a Breast Cancer Survivor or know someone who has been diagnosed, what are your thoughts about businesses donating proceeds and percentages? Four Days of Color with Leatrice Eiseman ~ Win a Full Color Training Scholarship + More! Buy Things For The Donation? I apologize if it came off crass to you, that wasn't the purpose. I have updated the base of the post to better portray what I was trying to say. It's great for everyone and has generates so many funds to help fight. I also personally think that if a business is going to step in to the arena and try this, it should be "all proceeds" not a measly 10% just to use it as a marketing scheme. no. it's about marketing, donating and how things like this can help both the cause and the business. Personally I feel that this post should not have been made until it actually was October. September is Prostate Cancer Awareness month & for the last week & a half all I have seen/heard in a variety of outlets is that October is for Breast Cancer Awareness. Everyone should be aware of all cancers year-round, but with designated months for various illnesses, Breast Cancer Awareness needs to reel it in a bit. For whatever reason it comes off as the only cause that really runs rough-shod over everything else - particularly when it comes to marketing & product placement! this really cool. a friend of mine was just recently diagnosed and i think all the support is a big help to her and her family. Very interesting article on the marketing aspects of it. As an advertising student, this trend is prevalent and doesn't seem to be ceasing. The 'Going Green' trend is even more prevalent - and it works all year around! i did not see this yesterday when i did this one. I was actually on the Susan G komen site yesterday. I actually ordered these gloves. They are about the most useless things I will own but I could not resist the marketing enticement. I usually buy a couple of things a year in support of the foundation and am involved in the cancer walks we have locally and with the whole cancer organization . However, this is just not something I had seen before. Personally I think you have too much time on your hands. You are crude and honestly a bit nit picking here. It was posted a couple days early and Molly would never do anything that rough "shodded" ( i know the ed form is not proper) over anything as you call it. Maybe breast cancer is so marketed because of its activism it does raise awareness for all cancers ....just by association. This is one of the first rude comments I have read on this site ...but then again..as implied by your screen name a thicket is used to dominating and does not play well with others. "Where a thicket is formed of brier ....it is called a briar patch"
I love our dear Molly & my remark was not intended as a barb against her as an individual. I stand by my thoughts regarding the marketing of Breast Cancer Awareness in relation to any marketing/awareness of other causes; BCA leads the pack with items to buy & as such, the most attention. I do have hope that it raises awareness for other causes by association, at least, as you put so well. But I also have hope - & quite the lofty ideal - that people would partake in causes without the "stuff" to buy. @glindathegoodwitch thanks for sticking up for me. ;) I appreciate your comments. Yes, BCA is hot for advertising for all year around - possibly more so than all other cancers. I also know that there are a bzillion other causes that need funding.... even past the spectrum of Cancer in any form. I know that children/people are starving and people are in dire need in many situations and diseases.... but that's the world and life... and if a ploy of advertising gets people to contribute to any cause, then I can't see that as a bad thing really. All the power to those who donate out of sheer generosity. I think that's awesome! I agree!! The whole, "All Natural" "Organic" "No MSG" "No Corn Syrup" "Light!" "Sugar Free" "Gluten Free" "Wheat Free" "Milk Free" "Lactose Free" - Advertising Ploys and Fads can make shopping more complex! Advertising at it's best, creates the idea that something that is "All Natural" or "Gluten Free" is good for you...when in reality it can be just as bad in OTHER ways. It's tough to be a consumer! Always having to read between the lines and research your products and company if you REALLY want to get in to what's going in to your food or products these days. 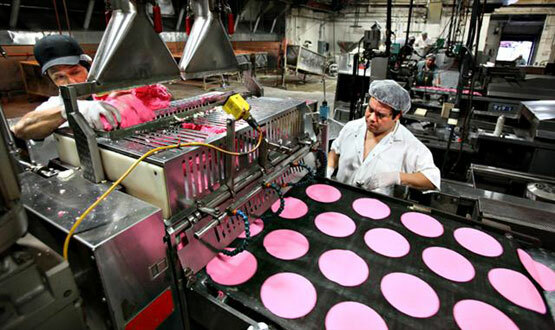 The "Going Green" trend is amazing in itself as some products might be recycled, but their footprint in manufacturing may not be so earth friendly. It's quite the toss-up. Most of us really only see the Green factor and choose to make the good decision to buy it, when all along is it any better? The art of advertising is so interesting. :) thanks for your comment! haha! love the gloves! 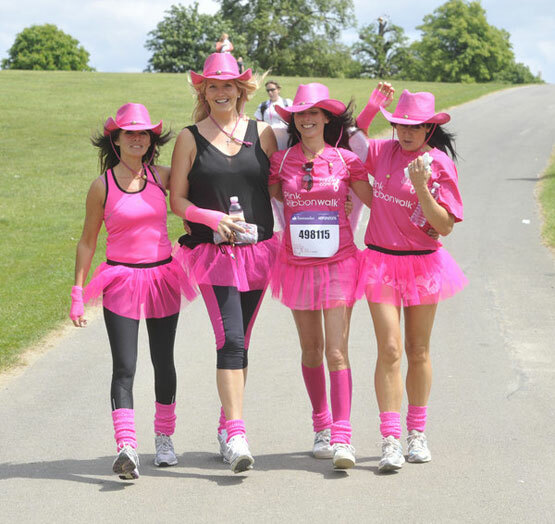 they will be fun to us in a BC walking/running event right?! I loved them so much i sent them to merchandising folks that does the collegiate products. 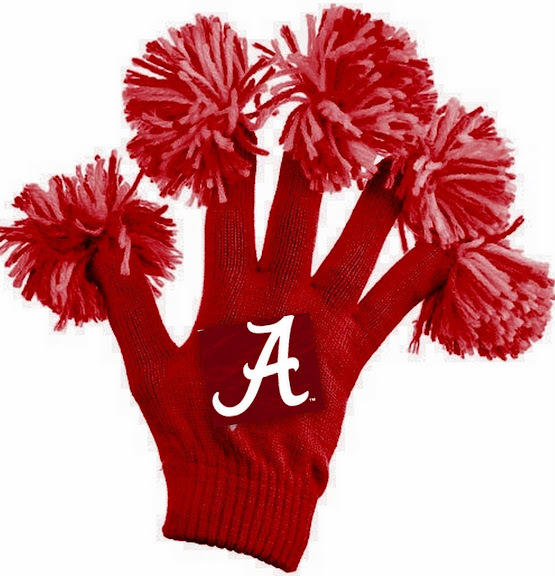 I of course attached the pink ones and gave the credit of course to the pink folks and told them to make these same gloves in Alabama stuff....forwarded to the marketing dept at Bama and I even enclosed a cut and change of the original to what I wanted to see. I think these would be huge sellers for college football.